With our full line of bathroom vanities, it was just a natural fit for us to start importing bathroom vanity tops as well. Now you can have the beauty of natural stone without the hassles of having to pick a slab and have it cut. Our granite vanity tops come pre-cut and ready to install, just like our cabinets. Our Marble tops come pre-cut and ready to install as well and come with a molded backsplash. 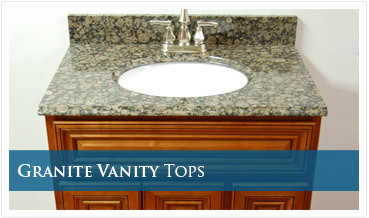 We have a wide range of vanity top sizes, all the way up to single and double bowl 61" vanity tops. The procelain sink(s) is pre-mounted, so there is no need to try to center the sink once the vanity top is installed. Backsplash is included with the granite tops as well. No sidesplash is available at this time. If you already know what colors and sizes you need, click here to view the full line of granite vanity tops on a single page for a quick and easy checkout.